Roy Keane downplayed his influence on the Irish team but poured praise on Martin O’Neill. A simple cup of tea. It was something that basic which was the making of Steve Staunton as an international footballer, maybe even as an adult. The story goes that when a teenage Staunton was called into the Ireland squad for the first time, the panel's senior statesman, Liam Brady, brusquely told the young Liverpool player to "go and make me a cup of tea, there's a good lad". Hurt at the notion of being a dogsbody, Staunton (bravely, it has to be said) told Brady, one of the finest players of the era, to "make his own f****** tea" and walked off, surviving to win 102 caps. 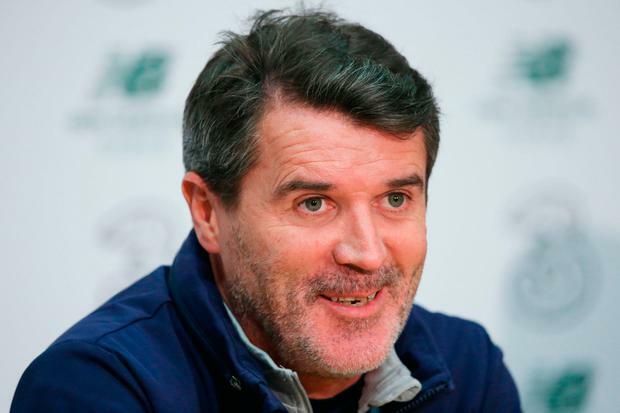 Three decades on, it seems Roy Keane has no issue with providing the Mrs Doyle role in the Ireland camp. Keane was in expansive mood when he was asked to look ahead to Ireland's World Cup play-off against Denmark yesterday. There was serious tension in the air when Keane was last involved in a World Cup play-off, that tension exploding on the island of Saipan months later, but Keane is remarkably laid back this week. Asked what precise roles he will fill this week, Keane was happy to pick holes in his own contribution. "Very little! Honestly, we don't do too much. A bit of light training, very little, very little. I'm not sure what I'm doing here to be honest with you," he says. "I make lots of tea, I said that before and people joked but I do make lots of tea for the staff and stuff. What else do I do? Not too much." He puts Mrs Doyle's housecoat back on a few moments later, when asked if the managerial merry-go-round in England of late makes him feel more relaxed in his Ireland role. "My desire, my focus is to try get through the next week and help the team qualify, of course. That's my... I suppose the word I'm going to use is that's my 'desire' at this moment in time. Nothing else. I'm not distracted by anything else out there, I'm not networking, I don't work that way. My focus is on trying to help the team in the next week or so and if that's making tea for everyone then hopefully that helps," he says with a smile. While Keane is eager to play down his own contribution, he did take time out to speak, at length, about how important Martin O'Neill is to this team and their current status, 180 minutes away for the World Cup finals. O'Neill's work on the training ground is often criticised, with lieutenants like Keane and Steve Guppy doing a lot of the work, but for Keane, it's when the Ireland manager speaks that Ireland listens. "There are hundreds and thousands of coaches out there but management is different. It's about saying the right thing at the right time, the right tone, the right message. You simplify things," Keane said. "I worked with Brian Clough and Alex Ferguson and I have obviously made it clear before about Alex Ferguson that, whatever you are saying about him, in team talks it was to say the right thing at the right time. "The key to the really top managers - and I go back to the managers whom I worked with - is saying the right thing at the right time. "Obviously that will not be through the media but at a team talk, maybe in the dressing room, maybe at half time, pre-match or be it in a hotel. "And I know that if I was a player, I like Martin's messages. Of course you are going to say that I have to say that because I work with him," Keane smiled. "But I always try to picture myself as a player and if I was a player and these were the messages that I was getting from the manager I would be going 'yes, I get that'. "His management of the players which is great. I certainly don't think we'd could be in better hands going into the next week with Martin as the manager, without a doubt. "I have worked with some good managers and I have been very, very lucky - in my career. "Even in my role with Martin, learning - I could not learn from a better manager. And this next week, that's what we were brought in to do, to manage the players, manage the training, manage the travel arrangements, manage the atmosphere in the hotel, loads of things with the other staff. "It all goes into the melting pot but then there has to be an element of trust in the players to go out and drop their job. "You don't have to tell the players. If players don't know by now how big the game is, we're all in trouble. The game and the pressure will take care of itself."